Carla's deep-fried egg rolls are filled with a perfectly seasoned combination of cabbage, green onions, and chopped meat or shrimp. Shredded cabbage and green onions are seasoned and stir-fried before rolling in egg roll wrappers. Add shredded carrots or other vegetables to the filling and use your choice of chopped meat or shrimp. Put the peanut oil in a 12-inch (or larger) wok or a 12-inch (or larger) skillet. Add cabbage and green onions and toss with oil to coat. Place the pan over high heat and stir-fry for about 3 minutes, or until cabbage is limp. Add the soy sauce, brown sugar, and chopped meat or shrimp and continue stir-frying for 1 minute, or until the vegetables are cooked as desired. Let the vegetable and meat mixture cool a bit and then fill the wrappers according to the directions on the package. Heat peanut oil to 370 F in a deep fryer or add about 2 inches of peanut oil in a deep skillet or saute pan. 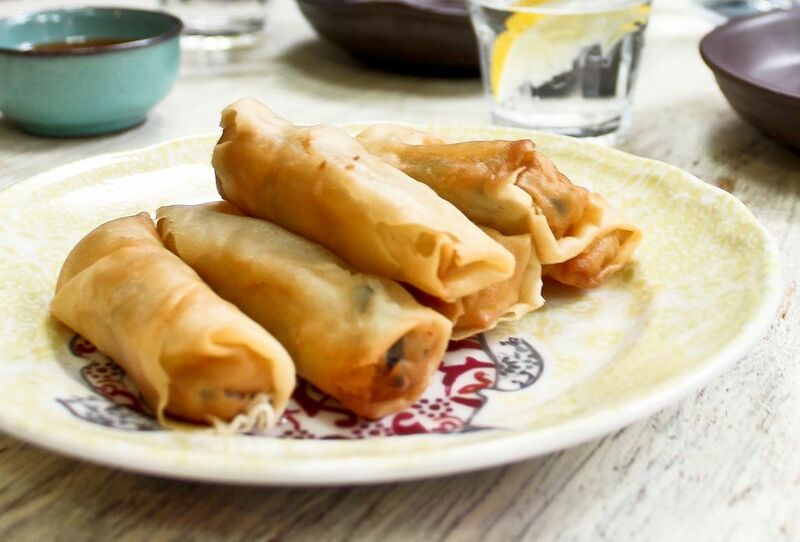 When all of the egg rolls are rolled, add some of them to the oil; do not crowd. The more you put in, the more it lowers the temperature of the oil. If the temperature does not recover quickly, the egg rolls will absorb more oil. Cook until the wrappers are golden brown, about 1 to 2 minutes. When they look almost as browned as you want them, remove them with a slotted spoon and drain on paper towels. Serve with sweet and sour sauce and/or mustard.